Amy Vilela is running as a Democrat in Nevada’s primary tomorrow. But don’t be fooled, Nevada. Amy Vilela is a Marxist. 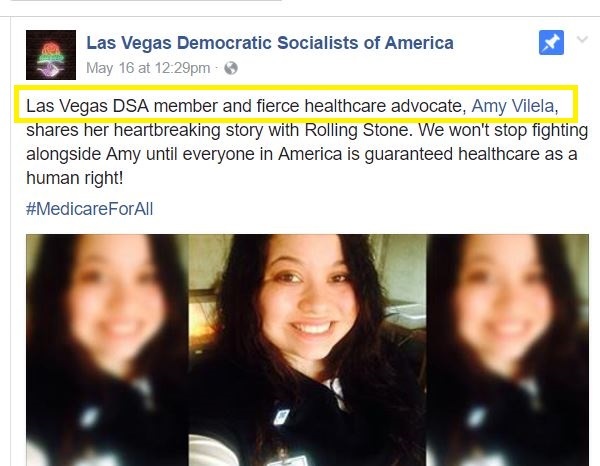 Vilela is a member of the Las Vegas branch of America’s largest Marxist organization, the Democratic Socialists of America (DSA). Her campaign manager, Keenan Korth, is the founder of the Las Vegas DSA. Las Vegas DSA member Amy Vilela has raised over $140,000.00. She has received support from DSA-Front Group “Our Revolution,” the Progressive Congressional Change Committee, the DSA-controlled National Nurses United, and the Bricklayers and Allied Craftworkers (BAC). @jakeypoohlvn Please educate yourself. A communist is NOT the same as socialist. Schools, fire depts., police are all socialism. This author would like to address Amy’s description of socialism as “Schools, fire depts., police” etc. The Constitution left all of those services up to the states, not the federal government. A local fire department is paid with local taxes. The Founding fFathers were quite brilliant. They did not believe that someone from Kansas, for example, should pay for something in Idaho. Read more about it here. Amy Vilela leaves her DSA membership off her campaign website. Don’t fall for it, Nevada!